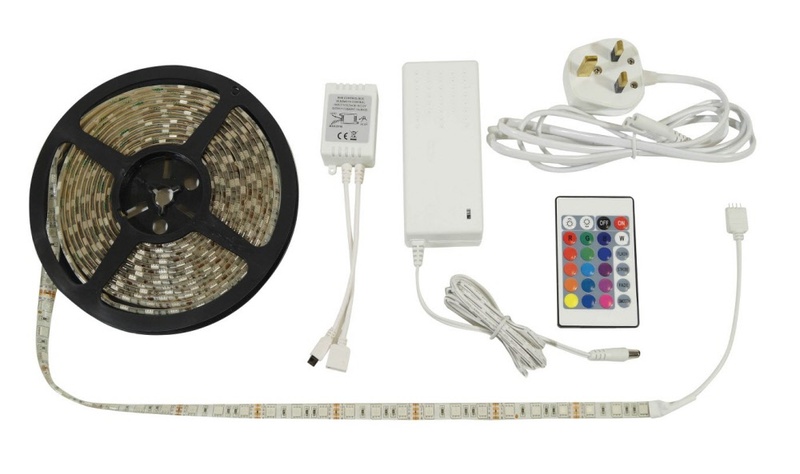 High Quality Plug and Play IP65 rated Colour Changing RGB LED tape light with 60 LEDs per metre. Covered in epoxy resin to protect the LED's the depth is just 2.5 mm and at 10 mm wide the tape is ideal for fitting into many unusual places. Supplied on a 5 metre reel with a self-adhesive back, this tape is easily applied to most smooth surfaces by simply removing the backing paper. The tape can be easily cut or joined, with cutting points at every 3rd LED (5 cm) intervals. Highly flexible and versatile with a low power consumption the tape is ideal for many uses such as decorative lighting in homes, vehicles, shops, bars and nightclubs and as the tape itself is weatherproof it is perfect for outdoor festive decoration. Included in the kit is the 24 key infrared handheld controller meaning you can turn the LED tape light on or off and adjust the brightness. The four function buttons control 'flash', 'strobe', 'fade' and 'smooth' operation and the 16 quick-change colour buttons control the true Tri Colour RGB chip and give 15 popular colour selections plus white. Requires 1 x CR2025 battery (included). Includes the RGB Control Box with Infrared receiver. The kit also includes a 12V In-Line Power Power Supply. The self-adhesive tape back allows for quick and simple installation in many applications including alcoves, kitchens, bathrooms, caravans or vehicles.